The drag bunt is an essential tool for a complete slapper. When a runner begins the play at first or second base, she should use home-to-first running techniques in the following situations: if stealing, if the bunt play is on, or if the ball is put into play in the infield and there is a potential force-out at the base to which she is advancing. If the batter is off balance during any part of the swing, she will not have the bat control needed to hit the ball where she wants to hit it. A well-balanced batting stance gives the batter a solid attack foundation. In High-Scoring Softball, Ralph and Karen Weekly provide the methods, strategies, and advice that have helped their Tennessee Volunteers consistently rank among the nation’s highest-scoring teams. 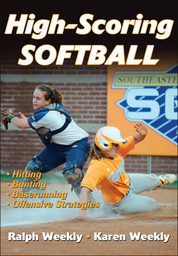 Applicable to all levels of competition, High-Scoring Softball includes 61 ready-to-use individual and team drills for generating high run totals every inning.